In today's blog we take a look at a few slides presented by SARB for their National Monetary Policy Forum on the 4th of October 2017. We will discuss a few of the slides and tie it in to our article on 16 October 2017 in which we looked at our current interest rates and where SARB wants the interest rates to be at, while we used Taylor's Rule to estimate where interest rates should be at. SARB's main mandate is inflation targeting. Basically SARB will use all the tools at their disposal such as interest rates (or in highly unlikely cases reserve requirements) to ensure inflation remains within the inflation target band of 3% to 6%. South Africa's monetary policy has been criticized in the past for either being behind the curve (for example increasing rates when inflation has already peaked, or decreasing interest rates to slowly). But in recent times SARB has provided a little more information as to what drives their monetary policy setting decisions. And we will take a look at a few slides from their Monetary Policy Forum presentation below, but as a introduction the graphic below shows SA's actual interest rates, the interest rates suggested by Taylor's Rule, as well as SARB's ideal interest rate or their wanted interest rate. The wanted interest rate was determined based on comments by SARB that they would like to see the real repo rate at 1.5% (thus the repo needs to be 1.% above inflation). We start of by showing the two slides below. The top slide shows South Africa's inflation rate (the red line), and SA's inflation target of 3% to 6% (represented by the dotted lines). Lastly the dashed red line is SARB's forecast of where inflation will be at in 2019. Keeping in mind SARB said they want the real repo to be at 1.5% adding 1.5% to 5.3% inflation gives us a repo rate of 6.8% (and it is currently at 6.75%). So essentially there is no room for further interest rate cuts up to 2019. The bottom of the two slides shown above shows strong food inflation levels experienced due largely to the drought. This is a classic example of cost push inflation (cost push inflation is inflation caused by external shocks such as supply shortages caused by droughts). While food inflation has moderated substantially during 2017, the new worry now is a particular item within food that is showing strong price increases. And that is inflation in meat. With meat carrying a 35.3% weight within food, the moderation in food prices as shown by the earlier slides might be short lived. And if this trend continues the forecasted of level of inflation for 2018/2019 will be adjusted accordingly making more interest rate cuts even less likely. 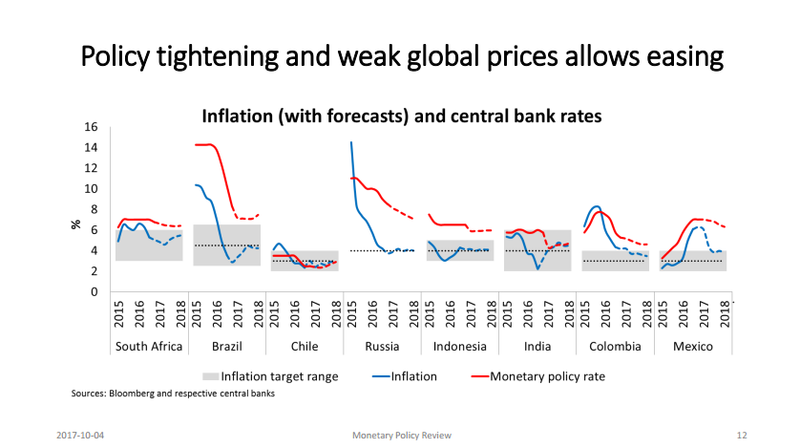 The next slide we will look at shows the inflation rates (including forecasts), the inflation targets as well as the monetary policy rates of various countries, include South Africa, Brazil, Chile, Russia, Indonesia, India, Colombia and Mexico. Readers might be wondering why these countries. Well they the most prominent emerging market countries in the world, and a lot of them have very similar economic structures to South Africa. The bottom slide of the image above shows just how difficult it is to predict oil prices (which is one of the major drivers) if not the major driver of inflation across the world. In May 2016 the forecast was for crude oil to hit $70 a barrel by 2018. However the latest forecast of crude oil prices (September 2017 forecast), shows crude oil is expected to plateau around the $55 mark. Essentially what SARB is saying is that they are less concerned about short term inflation rates (which have been declining), but they are more focused on lowering long-run inflation expections (by businesses, employees, employers, unions etc). The idea being if everyone is expecting lower levels of inflation in future, future inflation rates will be lower as people would be satisfied with lower pay increases as they expect inflation to be lower, and this will lead to businesses scaling back the rate of price increases as they expect inflation to be lower and they know salary increases are tied to inflation (and its expected levels). So for those hoping for more interest rate cuts, based on SARB's expectation of inflation up to end 2019, there is not a lot of room for them to move, if they want a real repo rate of 1.5%.